In an audio studio, club or venue setting the speakers are the last piece of equipment that will hold your sound before it hits the listener. Utilizing cutting edge technology and built with high quality and ever-lasting parts, the PW1555UI ABS molded 15'' Two way Active Loudspeaker with USB / SD Card Inputs & iPod Docking Station will properly translate your sound and remain consistent in the most rugged conditions. The PW1555UI is a Two Way Active Loudspeaker. "Active" means the amplifier is built-in and does not require any other amplifier. This will give you the luxury of not having to hook up an additional amplifier, it’s all inside! Use the ergonomically shaped handles and top handle for easy transport or use the pole mount and raise your speaker to any height you need! This loudspeaker is not only a self powered loudspeaker it can also play music from your USB flash drive, SD CARD or iPod! This loudspeaker is not only a self powered loudspeaker, it is an iPod DOCKING STATION, it can also play music from your USB flash drive and SD CARD! The options that Technical Pro built into this amazing speaker are the options you need in today’s professional audio world. The design boasts durable a top handle and two side handles for easy mobility. This can be mounted on a pole or left on the ground. This is a great speaker for a mobile set up! 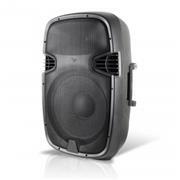 This is a great speaker for your deck or yard plug in and you’re ready for your party! The PW1555UI is an active loudspeaker that can push out a massive 1100 watts of peak power. It is a powered loudspeaker, this means the amplifier is built in, there is no need for an additional amplifier! The outside casing is built to withstand harsh conditions and will hold up in transit and while in use. The front is covered by a rugged steel grill that will allow your music out while keeping your speaker safe from harm. The insides hold a 15" woofer with 2.5" voice coil and 50 oz. magnet long-excursion driver. The high frequency speaker is a 1.375" Harmonic 13oz. titanium driver. Both types of speakers are constructed to give a long, clean throw of booming lows and crisp highs, the technology inside is meant to provide the most professional sound in today’s market! This speaker will achieve that professional "club" sound you seek. The back panel hosts the controls, input/outputs, and iPod docking station. You can plug your iPod or iPhone into the docking station and play your music through this loudspeaker. Plug in your USB flash drive or SD Card and play your music from these sources as well! The LCD display on the back panel will show track information such as remaining time and title of song. IPOD DOCKING STATION, USB THUMB DRIVE AND SD CARD INPUT!!! Technical Pro really stepped things up with this release allowing you play the most common audio sources without any other bulky equipment or adapters! Additionally there is a RCA and balanced XLR input for connecting sources such as a CD player, DVD player audio, a DJ mixer, etc. This speaker can take any source and push out the highest quality sound that exists! The outputs are a passive 1/4" or XLR connection. This allows you to send your signal through input of the PW1555UI to another audio device or even another powered speaker. This signal will remain passive and be unaffected. This will give you even more options while setting up your sound design. The Line inputs consist of RCA (Unbalanced), XLR (Balanced), USB flash drive & SD card. Connect your standard audio sources like a mixer or tuner to the RCA or XLR inputs. Connect a USB flash drive or SD card up to 32GB’s and play your .mp3 or .wma files. Or connect your iPod into the iPod docking station. The PW1555UI has 1/4" and XLR microphone inputs. Plug in a couple of microphones and host a vocal performance, a karaoke style party or talk over your music to your crowd.